This is our go to get-dinner-on-the-table-quick meal. It's fast, it's yummy, and it's oh so comforting after a long hard day. If you don't have collard greens on hand, sub in any type of kale - lactino/dino kale is quite tasty in this dish as well. 3 strips of bacon, cut in 1/2 inch bits. Bring the water and sea salt to a boil in a medium pot. Add the corn grits and whisk throughly, turn heat down to medium low, cover, and simmer. Whisk or stir every 10 minutes or so until thickened to your liking, about 30 minutes for my preferred consistancy. While the polenta is cooking, heat a large skillet to medium heat and cook the bits of bacon. After the bacon is cooked, scrape the bits into a medium sized bowl, but leave the grease in the pan. Remove the collard greens just as they begin to get crispy and add them to the medium sized bowl. When the polenta has finished cooking, remove from heat and whisk in the butter and goat cheese. 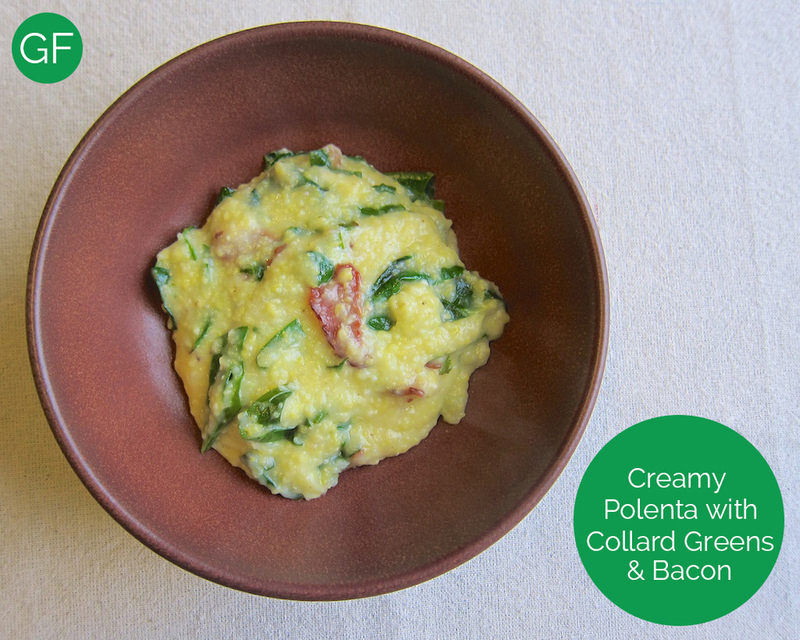 Pour the polenta into the bowl with the rest of the ingredients and carefully fold together to combine well. Serve while the polenta is hot!